The Great Snowstorm of 2015 turned out to be a bust here in New Jersey — a fact for which The Legal Genealogist is exceedingly grateful. If we end up with 10-12″ of snow total, rather than the 24-30″ predicted, that will be a lot. New England, on the other hand, is still being hammered. Snowfall totals already exceed two feet and the snow is still falling. Road crews are out constantly trying to stay ahead of the snowfall, clearing the roads, salting, sanding. What did our ancestors do about snows like this? For the vast majority of rural folks, of course, winter was a time for hunkering down and hoping you didn’t use up all the supplies you’d laid in during the spring, summer and fall before the last snow fell and the ground started “greening up” again. But what if you were in town? Or a city? Just when did the snow plows start coming around anyway? Aren’t you glad you live now, and not then? Too young for the horse-drawn sleighs, but I do remember snow plows on the front of the engines moving along the railroad track a block from our house in Idaho as was growing up. They were a sight to behold! 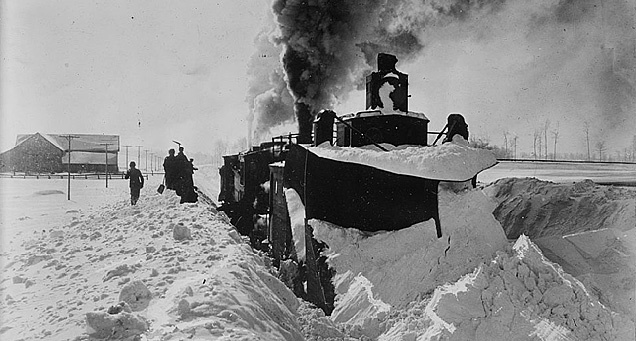 I grew up a 90-second walk away from the main line of the Pennsylvania Railroad — and don’t remember the plows at all. Sigh… Must have been amazing to see. If I lived in Michigan, I’d want tunnels too! Absolutely a lot of outdoor activity, Mary Ann — but planned-for and prepared-for! And not dependent on things like coal deliveries to the apartment building furnace. I grew up in a western mountain valley that regularly got snowed in when the passes closed down. Not much snow in the valley, but when I look back on it, I kind of marvel out how well we did. Good for business, all those stranded travelers. We knew better than to try. I live in Vermont now. Vermonters get glum when it doesn’t snow, so the mood anticipating the storm here has been pretty upbeat. 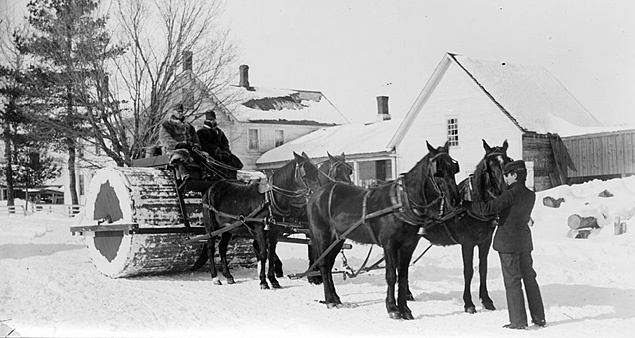 However, in my Vermont village, the snow plows create more problems than they solve. What good does it do to plow the roads and streets if it results in huge mounds of compacted snow across the driveway and walks? That have to be moved again, usually by hand? Ugh. There are old-timers here who remember when the roads in some places were still rolled, and wish they still were. (As soon as the plows go through, the sirens start up.) One year we got a great storm that wouldn’t quit and the side roads didn’t get plowed for several days. People loved it: skiers and snowshoers on the streets. Kids on sleds. Happy villagers. Where I lived in the Colorado Rockies, they still do oack the snow on all but the main roads. Of course, the situation is different there: the snow is dry and drivable, not wet and slippery like New England’s. The air is dry too, so what was left on the main roads subliminated off. Safe for the tourists. I loved living there: I could step out my door, put my snowshoes on, and take off anywhere. I tried that here once, following side streets and dirt tracks. On the way home had to take the snowshoes off- all those piles of dirty, compacted snow. Bah humbug. In Vermont I have to actually *drive* to a trail to snowshoe! It sure is pretty out there right now, though. Main part of the storm hasn’t got here yet, and looks like it may slide right by. Darn. I’m not a winter person, never have been and never will be, so the idea of looking forward to snow is alien to my mind processes. Farm families often put a rope between the house and the barn in case of storms. People hung onto the rope when going back and forth. And, have read more than one account of children and adults being frozen after being caught in an unexpected storm. Just reading the “Little House on the Prairie” series by Laura Ingalls Wilder gives some an idea of what it was like. Can’t imagine it was easy. Our nephew said they have over 2 ft. in Boston right now and snow is coming down hard. Might be over 3 feet by the time the storm ends. The worst I’ve read about was the blizzard called the Children’s Blizzard — 230+ lives lost in January 1888. I have a photo of my grandfather captioned “L.B. Walker, county engineer; Percey Struck and Ernie Miller stand next to Franklin county’s new, $13,000 snow auger in 1929.”. Not a plow, it was like a big snowblower. Iowa snow is a PITA. That is very cool. Lots of images of snow augers in the patents database. When I was a kid, my mother taught me that “snow” was a “four-letter word” and was to be treated like all those other “four-letter words” that I was not allowed to say. I remember having to shovel snow before leaving for school, and snow drifts 3 feet high to climb over on the way. Sounds like your mother — and you — are as “enthusiastic” about snow as I am…! A friend of ours used to live in a historic farmhouse in Vermont which had a sort of enclosed breezeway running from the house to the barn so that the farmer would always be able to care for his animals, no matter how deep the snow. But my favorite solution of all is the elevated walkway up in Saint John, New Brunswick, which allows people to walk throughout the central business district without going outdoors — no winter cold, no summer heat, and NO TRAFFIC. Brilliant!